I don't normally to this, but the reaction I had to this book and the fact that I was over halfway through when I threw in the towel makes me want to write something about it. Luckily I have a place to do that. Hello blog! Um, so this book has actually been fairly well-received. And I felt the premise was really interesting, and definitely creepy, and things started off strongly. I didn't love any of the characters but that's okay... or so I thought. It made me think, it made me curious to know what was happening next. I was listening on audiobook, and it's a rare audiobook that I don't finish, so I figured I'd just keep going even if I wasn't loving it (also: book club.) But then the rage started. 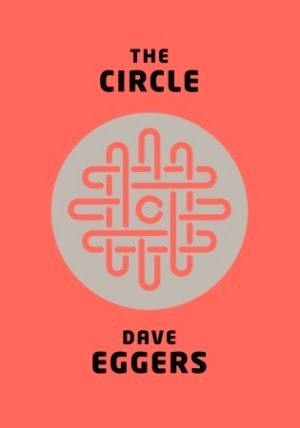 The premise is that Mae Holland starts work at a big tech company in California, a company called The Circle. It's a bit like Facebook and a bit like Google and a bit its own thing (and has already subsumed Facebook and Google and all the rest.) It's a great place to work, but all is not as it seems. About a disc and a half in, it was really feeling like things were too good to be true - and of course they were. And then. The further we got, the more I disliked Mae. This is 100% intentional on the author's part, and I think what I find most interesting here in my reaction is that he really did a good job. When I was sending my comments to the book club, I made a confession: I know I have said in the past (likely here on the blog too) that I don't have to like the main character in order to enjoy a book. This may be true, but I'm not sure I can actually tell you the title of a book I've enjoyed where I didn't like the main character. Mae starts out a bit... not loveable, but as the book progresses she becomes more and more obnoxious, stupid, vapid, selfish, thoughtless, and righteous, none of which is very fun to spend time with. In fact, I started wondering why I was spending hours of my life with characters I mostly wanted to punch in the face. When, finally, one night at 2am I was still awake feeling furious with her, just over halfway through the book, I quit. I am not saying this is a rational response, or a good one, but it's not unusual for me to get really emotionally invested in a book. I prefer that I get emotionally invested in a positive way. I don't really have room in my life for books that make me feel that much rage right now. I need my sleep. The premise was really interesting, and I think important. It certainly did make me think very seriously about how I use technology and how I feel about privacy, and why I think privacy in my online and physical life is important. It had things to say about the gradual erosion of our privacy and of meaning in our lives, without feeling like a conversation with a grouchy old uncle who thinks we should all go back to rotary telephones and making our own jam. (I am kind of with him, though.) It is even clear that these ideas that erode our privacy can be good - they can be convenient, they can help the world become a better place - but we have to be vigilant and we have to have protections in place, protections with teeth, sometimes to protect us from ourselves. Finished it, but absolutely hated it! Sorry I wasted my time reading it. Thankfully I'm a fast reader so it wasn't a lot of time. So, curious: Why did you stick with it if you hated it? I know lots of people do that (I used to be one of them) but I've decided the angst on my part isn't worth the payoff of finishing a book. I think this has also coincided with the fact that I'm a much slower reader than I used to be. The number of books I can get through is so limited at this point, I can't afford to waste time on something I'd rather not be reading!